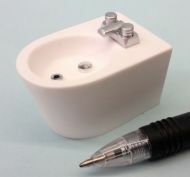 A range of our Bathroom products that initially debuted at Autumn Miniatura in September 2013, and have been added to at Spring Miniatura in March 2015 with our new Sleek-line Loos and a Basin on a vanity unit, and in April 2016, after a customer pointed out at a previous show that the bath taps didn't match the vanity unit taps, so we added a bath that did!! 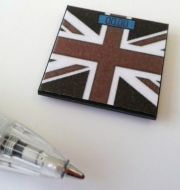 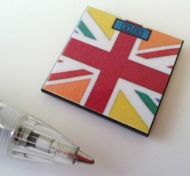 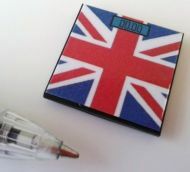 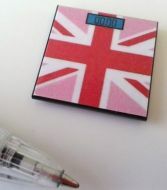 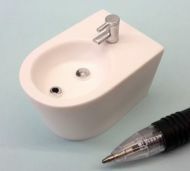 And following other customer requests we now make Bidets with taps to match either of our tap styles! 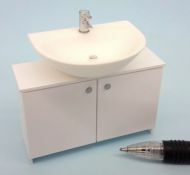 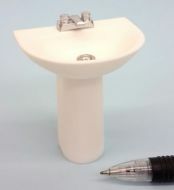 A 1/12th scale Collectable dollshouse Miniature Basin for our new bathroom range. 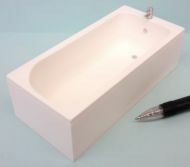 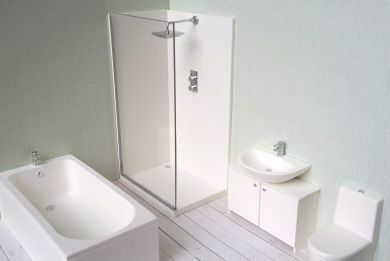 A 1/12th scale Collectable Dollshouse Miniature Bath for our new bathroom range. 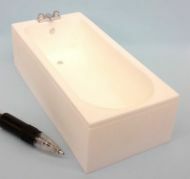 1/12th Scale Collectable Dollshouse Miniature Bidet with Flat Mixer Tap to match our original bath and basin.